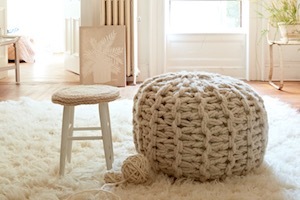 Let your capable, creative hands transform a pile of yarn into this fabulous pouf! Everyone needs a lofty, luxurious knit pouf in their home, especially one without the usual price tag. Make this arm-knit version with Anne, and you’ll walk away from class with a gorgeous pouf shell ready to be stuffed and finished in a matter of minutes once you get home. You’ll also leave class with the skills to make all sorts of arm-knit goodies. You’ll adore playing with the size and scale of this new technique. Be amazed at the ease with which this technique is learned and the fast, furious, fun of it all. This class is perfect for folks that have never picked up a knitting needle AND for the most experienced knitter who’s up for learning something new. Students will learn how to cast on, knit, purl, bind off, and seam arm knitting, as well as learn the closure technique to make the pouf.